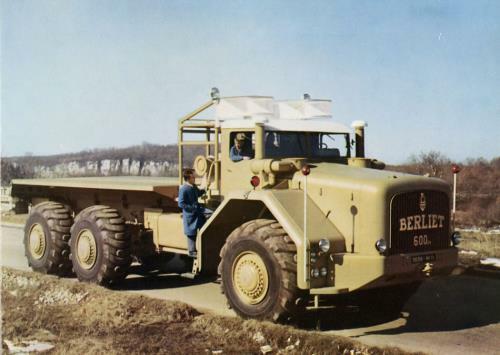 While oil prospecting the Sahara was in full swing, Berliet designed a giant truck weighing 100 tonnes with 600 hp which he launched at the Motor Show. Produced in a few months, the T100 was designed to transport heavy equipment to the desert for the large oil production sites. He left the Berliet site at Monplaisir in the night of 25th to 26 September to attend the Motor Show 1957, where he created the surprise. The largest truck in the world in its time, its exceptional dimensions impressed the numerous visitors. Berliet, who supplied the majority of vehicles for the oil industry, had designed a Saharan stand which was specially dimensioned for the giant truck. He was awarded the 1957 Grand Prix for Art and the French Automobile Industry. Only 4 examples of the T 100 were built, the end of the Algerian war putting a stop to oil prospecting.